From @finalsound: "Awesome show tonite - just spoke with Tim Pope at aftershow - re the LatAm film, he is "waiting for our lord and master!" in other words, don't hold your breath!" Tim Pope reassures us all: "Look, to the thousands... well, the many... who asked me personally last night: it will happen and it will be great. OK?!" Once again, a huge thank you to the brilliant JC/Perfect.Murder for his updates tonight. He truly is the best! So funny! He made little custom photos for each song tonight, instead of just typing the name. Also, a huge thank you to Geoff and Olivier for their setlist updates. Sincerely appreciate it so much! Thanks to @buddhafreak for the vines and to everyone who sent photos, info, etc. Can't do any of this without your help. Thank you! Vines: Plainsong / Prayers for Rain 1 - 2 - 3 / Strange Day 1 - 2 - 3 / Night Like This 1 - 2 - 3 / Stop Dead 1 - 2 / Push 1 - 2 - / Inbetween Days 1 - 2 - 3 / 2 Late 1 - 2 / Jupiter Crash 1 - 2 / For more of BuddhaFreaks Vines, check here. More photos at the Teenage Cancer website and Facebook. Shake Dog Shake - London, Teenage Cancer Trust 28-Mar-2014 from itsaperfectday on Vimeo. A Strange Day - London, Teenage Cancer Trust 28-Mar-2014 from itsaperfectday on Vimeo. 2 Late - London, Teenage Cancer Trust 28-Mar-2014 from itsaperfectday on Vimeo. Freakshow - London, Teenage Cancer Trust 28-Mar-2014 from itsaperfectday on Vimeo. 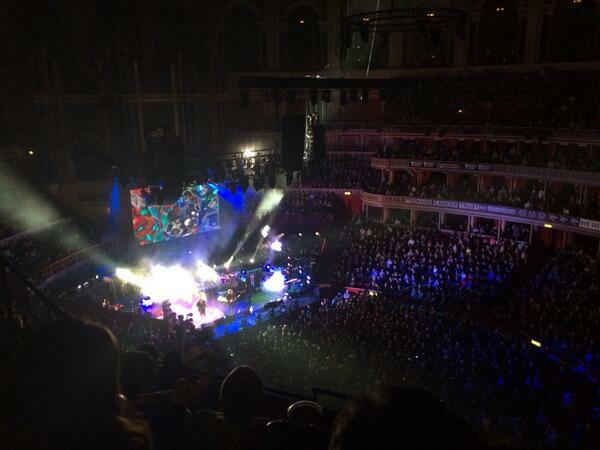 Stop Dead - London, Teenage Cancer Trust 28-Mar-2014 from itsaperfectday on Vimeo. Harold and Joe - London, Teenage Cancer Trust 28-Mar-2014 from itsaperfectday on Vimeo. Huge, enormous thank you to JC/Perfect.Murder for the setlist and photos and fun! Truly appreciate it, my friend! And thank you to @buddhafreak for the vines, @iapdtweet & @guitaraidlondon for the setlist help, and everyone who posted Instagram videos from the show. Soundcheck: Jupiter Crash, 2 Late, Harold & Joe, Freakshow, Play For Today, High, Friday I'm in Love, Plainsong. 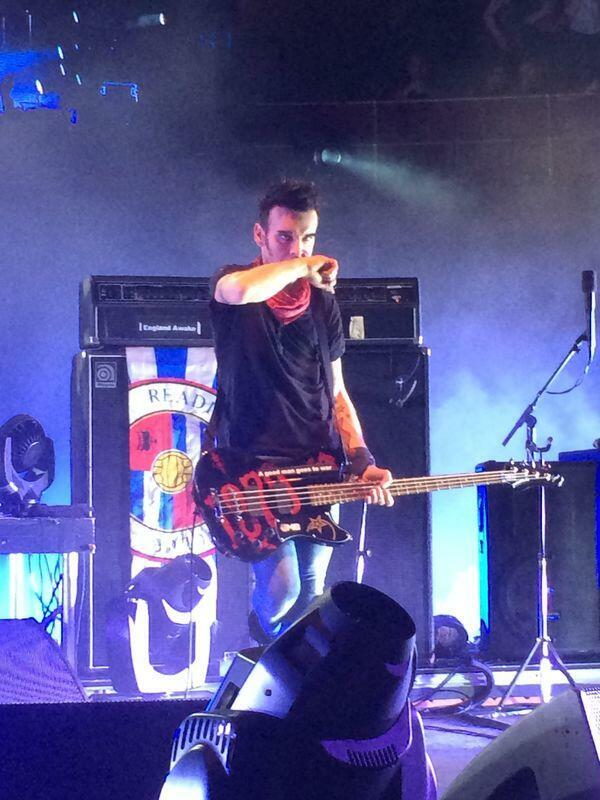 Simon keeps the Doctor Who love going tonight with A Good Man Goes To War sticker on his bass. Listen to Matthew's report here at 1:09:50. Larger image here. Jeff will not be happy. :) Just checked with Teenage Cancer Trust and they confirm these shirts will only be sold at the shows. No online sales. From Schecter on Facebook: "One of the two Custom ULTRACURE's made for Robert Smith to play at Roger Daltrey's Teenage Cancer Trust show on March 29th at London's famed Royal Albert Hall. After playing these two Signature models, Robert and The Cure will sign them to be auctioned for this very worth charity. 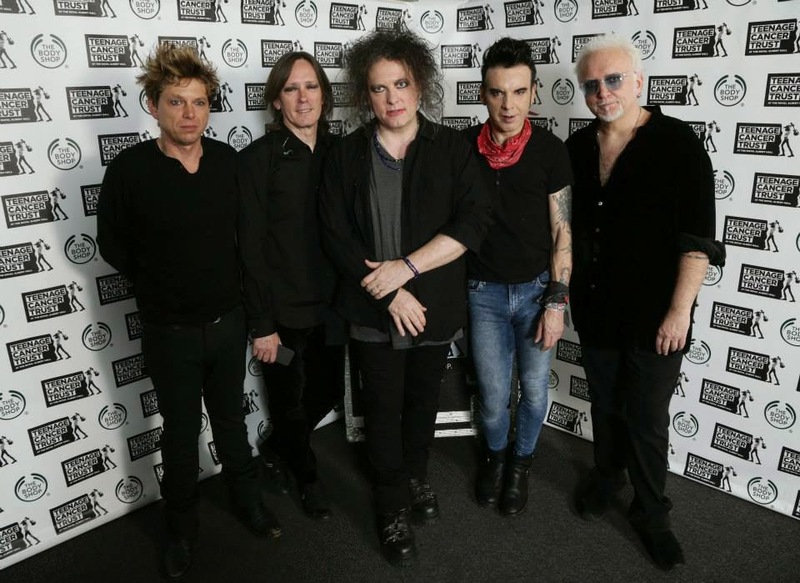 Schecter Guitar is proud to stand with The Cure to help. For more information go to www.teenagecancertrust.org"
Keep checking for RAH tickets! As promised by The Cure and the promoters, more tickets are starting to pop up. Check RAH 29th, Gigs and Tours, and See tickets daily. Update (03/27/14): Standing, Stalls, Circle tix for the 28th available right now. And Standing & Circle for the 29th. Same available at See Tickets right now. Also, Grand & 2nd Tier and Stalls for the 28th here. From Frank: "Am looking forward to Dj-ing at the Aftershow parties, I am wondering if people would like to leave some requests here of tracks they would really like to hear on these nights?" 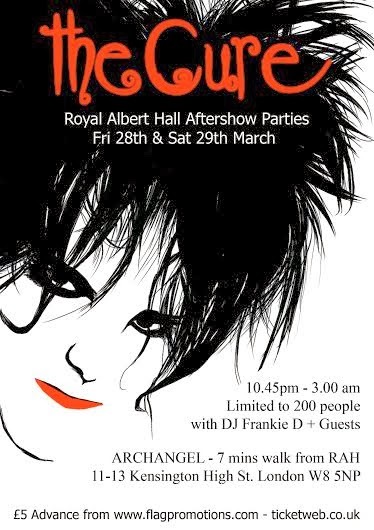 And there seems to be another Cure event at The Caterpillar Club at The Garage in London on the 29th from 11pm - 4am. PoP Campaign are Djing and it will be 25% Cure. Details on that here. HispaCure, Spanish Cure fan club, will be celebrating their 10th anniversary at The Queen's Arms Pub on March 29th, 4:30 - 7:00. Facebook Event Page. Thank you to everyone who sold their extra tickets at face value to other fans. You made a lot of fans happy. Cheers to you! See what XFM thinks are The best Cure Lyrics Of All Time. If you're going to the Royal Albert Hall shows and wouldn't mind helping me with the live coverage, please let me know. Mainly looking for someone to provide the live setlist updates and photos of the merchandise, but anything you want to contribute will be welcomed. If possible, Olivier will be providing updates at It's A Perfect Day, but we can always use backup. We can do it via email, Twitter, Spacebook, text, WhatsApp, whatever works best for you. Have safe travels to London, and a fantastic time at the shows! Special Cure RAH t-shirts & don't be late! Update (03/25/14): For those who have asked, Pearl's website can now be found here. Info on Pearl's music project, Swanson's Daughter, can be found here. Looks like some last minute tickets may be released. This from @gigsandtours: "Extra tickets will be released during the week for @TeenageCancer Trust at @RoyalAlbertHall this week. Keep checking our website for info!" There might be some exclosive Cure merchandise on sale at the show. This from @RoyalAlbertHall: "Don't miss exclusive @TeenageCancer merch on sale here all week, starting tonight at Ed Sheeran. pic.twitter.com/ITUJHRUncO"